[Bokononestly] found a lil’ music box that plays Stairway to Heaven and decided those were just the kinds of dulcet tones he’d like to wake up to every morning. To each his own; I once woke up to Blind Melon’s “No Rain” every day for about six months. [Bokononestly] is still in the middle of this alarm clock project right now. One day soon, it will use a *duino to keep track of the music box’s revolutions and limit the alarm sound to one cycle of the melody. [Bokononestly] decided to drive the crank of the music box with a geared DC motor from an electric screwdriver. After making some nice engineering drawings of the dimensions of both and mocking them up in CAD, he designed and printed a base plate to mount them on. A pair of custom pulleys mounted to the motor shaft and the crank arm transfer motion using the exact right rubber band for the job. You can’t discount the need for a hig bag ‘o rubber bands. In order to count the revolutions, he put a wire in the path of the metal music box crank and used the body of the box as a switch. Check out the build video after the break and watch him prove it with the continuity function of a multimeter. A clever function that should at some point be substituted out for a leaf switch. We’ve covered a lot of cool clock builds over the years, including one or two that run Linux. And say what you will about Stairway; it’s better than waking up to repeated slaps in the face. Inspired by science fiction movies, this DIYer created a doomsday device prop complete with pull-pin, epic LED lighting, and countdown timer. When his microwave broke, he salvaged its innards to build this device. Overall, this project is a great way to improve your electrical, mechanical, and creative design skills. Inside the device is an Arduino which coordinates the communication between the push buttons, clock timer and lighting effects. The bulky mass of electronics seen at the bottom of the device are high power hardware from the guts of the microwave. Additionally, an old garden light was used for the “core” of the device and ancient tape recorder buttons were resurrected for pushbuttons. When you’re ready to build your own apocalypse device (or perhaps just an epic looking alarm clock), check out the project guide to get started. This is an original way to hack a dvd-player and integrate it with an allarm-clock. Well, building up a new Digital Alarm Clock with Arduino is the real project, the integration with the DVD-Player is the Hack. Thanks [razrbhr] to send us your project. This clock radio plays tunes from Minecraft and it’s decorated to look just like a creeper head. In the game mob heads are available as decoration and [Young_Maker] liked to spice up his virtual bedside table with a creeper head. But we think it looks just as good in its physical form. 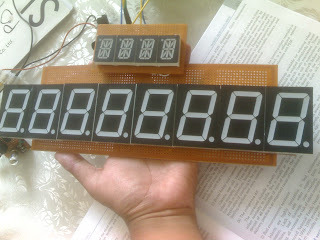 The main part of the clock is an Arduino with a character LCD screen. A DS1307 real-time clock makes sure the device is accurate. We called this a clock radio in the title of the post, but it’s more of a clock MP3 player. The uMp3 board is used to play random music from the game. We would categorize the soundtrack as minimalism, which is a reasonable way to gently wake in the morning. But if time runs out the boom of an exploding creeper is played to make sure you’re not late for work. We’ve embedded [Young_Maker's] demo video after the jump.